As Washington scrambles for a deal to avert another shutdown, the Rio Grande Valley is in the middle of their own border wall debate. WESLACO, Texas — A wall or no wall? That is the question at the center of the current political debate that has already led to a partial government shutdown, with another one looming in the horizon. Depending who you talk to on the U.S.-Mexico border, the reasons for or against the wall tend to vary. At the southernmost tip of Texas is a community linked by four counties named the Rio Grande Valley. It’s the most active sector for the U.S. Border Patrol along the southwest border. The KENS 5 Border Team rode with the sector's chief deputy patrol agent, Raul Ortiz, and a handful of agents to visit the lower east side of the valley in Cameron County. “This was the hottest spot in the country. This was before we had any infrastructure, any cameras,” Ortiz said. Within the mix of rural and urban communities exists a levee wall topped with steel bollard fencing that was installed after the 2006 Secure Fence Act. It runs 55 miles along the border, with some gaps in between. 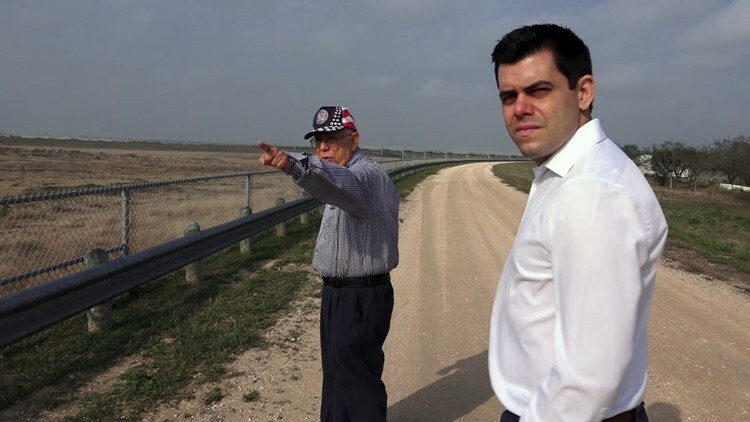 “What we’ve asked the administration and Congress for is something very similar to this,” noted Ortiz as he pointed to an area on the banks of the Rio Grande, south of the City of Harlingen. Watch the video below with a longer, more in-depth report at the situation on the border. Ortiz said the right combination to secure the border consists of patrol units, fencing and surveillance cameras. He argues it makes it harder for smugglers to get through. “You’re not going to control everything," he said. "Our goal is to be as effective as we possibly can." Harlingen patrol agent Sean Watson explained that until 2010 he would encounter illegal smuggling on a daily basis. "And now we see maybe, maybe some activity...maybe once a week,” Watson said. It’s the same approach Border Patrol is bringing to the upper west side of the sector in Mission, Texas. In the next couple of weeks, construction crews will begin installing five miles of levee wall funded by Congress in 2018. It’s the same location where the Carrizo-Comecrudo Tribe led a march alongside environmentalist against the border wall. The tribe is not officially recognized. The Trump administration waived 28 laws to make way for the wall, which would run through sacred land, parks, nature centers and homes. 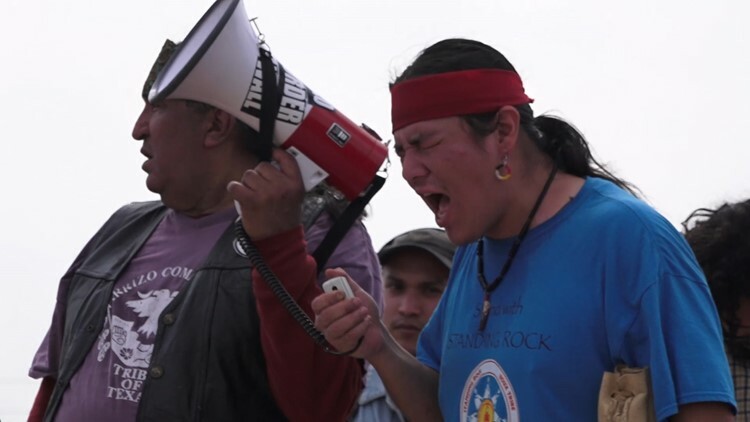 “We have to start recognizing the fact that we the people of the land have an inherent right to stand up and to say ‘no more,’" said the Carrizo-Comecrudo tribal chairman Juan Mancias. Rey Anzaldua, a 74-year-old retired U.S. Customs agent and Vietnam veteran, is taking the fight to court. “We didn’t cross the border. The border crossed us,” Anzaldua said. Anzaldua claims his family has lost thousands of acres over time to the government through the process of eminent domain. He says his ancestors were early settlers who took ownership of the properties through the Spanish land grants. The latest government seizure was in the 1960s, which came later with a levee wall built in the town of Granjeno, next to Mission. Now a new wall threatens to take more land from his cousin’s property. Rey Anzaldua points to land lost to the government through eminent domain. Down the levee road, a helicopter and a surveillance blimp caught two Guatemalan men crossing the Rio Grande in an area without a wall. The men told the KENS 5 Border Team that smugglers instructed them to traverse that area. 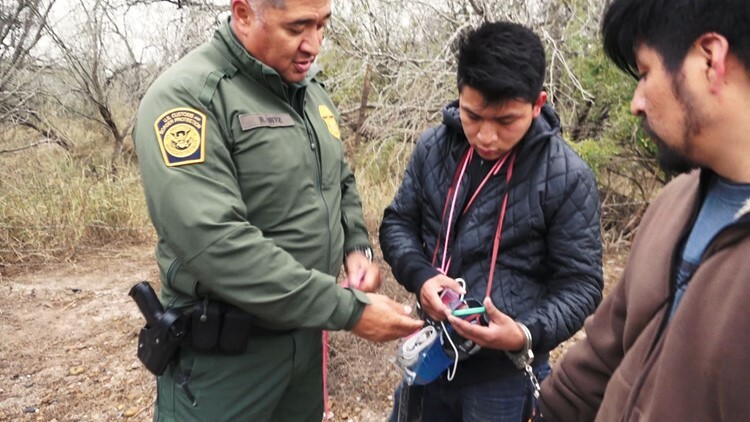 They carried a navigation system and phone chargers smugglers sold to them for $50. “We call this virtual smuggling,” noted Ortiz as he pulled clear plastic pouches out from the men’s jackets and revealed its contents. In the bags: a compass, phone chargers and cables. Minutes later, in comes another call for assistance. The KENS 5 Border Team followed agents west of Mission where they encountered a family of Central Americans surrendering to agents after crossing the border. A 19-year-old Salvadoran man from the group said he was relieved to be safe from anymore danger. 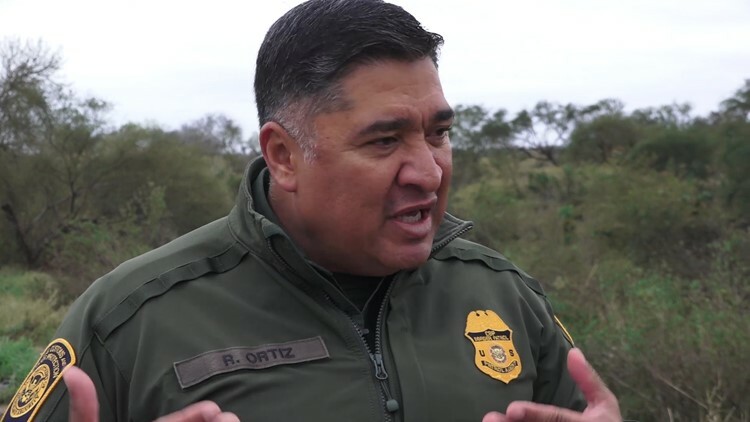 Ortiz estimated that about 25 percent of his manpower goes to processing asylum seekers, including unaccompanied children and family units. He said it’s a cartel tactic to distract agents. 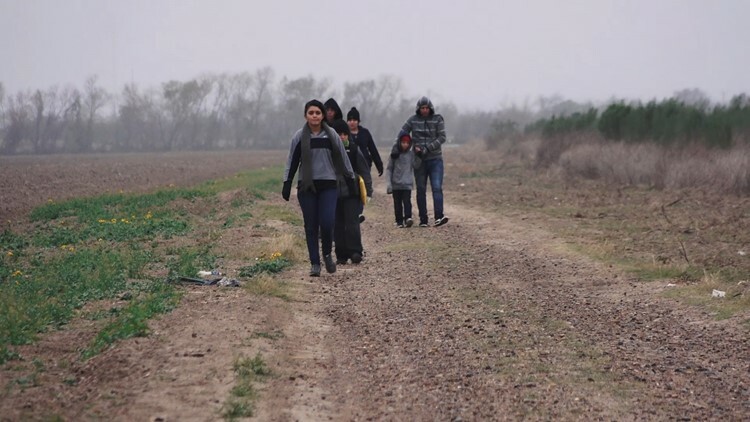 Family unit of Central Americans walk up to Border Patrol after crossing the border. “In the areas that they do try to exploit are typically areas that we haven’t installed a gate yet or areas where we haven’t finished the fencing,” he said. Realtor Terry Urdal has tried selling the same thousand-acre property where the migrant family was found. “Look at all the jeans and stuff here. 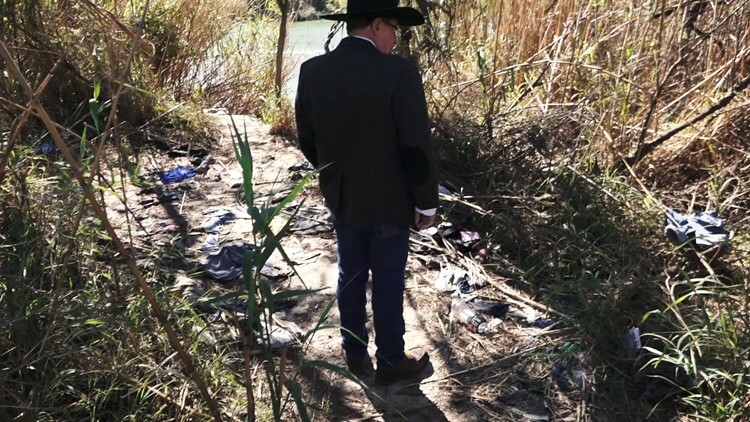 This is obviously where they cross the river,” said Urdal as he walked over a pile of clothing and accessories discarded by passing migrants. Urdal, a first generation Norwegian, said illegal immigration is costing him thousands of dollars in lost commissions. The property is listed for $2 million. Realtor Terry Urdal stands on top of pile of clothing discarded by migrants. If Congress and President Trump end up agreeing on funding for more wall, Urdal believes the government should give fair compensation. Although both experts and critics agree a wall won’t solve all immigration issues, Ortiz said it helps buy agents time. The country will have to decide if that’s worth the price tag of eminent domain, as most of the property along the Texas-Mexico border is private land.